Thanks to advances in modern medicine, we are now better equipped to manage these conditions through a combination of lifestyle choices and medication. While the benefits associated with advances in modern medicine are impressive, there are also potential hazards that aging adults and their families should be aware of. For example, seniors who take a variety of prescribed medications combined with over-the-counter (OTC) drugs could potentially face toxic and adverse drug interactions. Assisted Living communities like Regency Morristown help residents maintain their medications on a daily basis, while also ensuring they stay physically active in order to manage chronic health conditions. Medication management is not an easy task, regardless of your age. 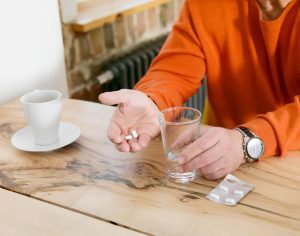 However, there is an increased risk of adverse drug reactions and events for aging adults who are unable to take prescribed medications at the correct time, and to completion. This can lead to aggravation of chronic conditions, and even visits to the emergency room. These types of incidents are often the deciding factor, triggering a senior’s initial move into an Assisted Living community. This move gives peace of mind to family members, while also allowing their loved one to enjoy the independence of living in their own apartment. Services such as transportation to doctor appointments and medication reminders provide a “safety net” for families and seniors transitioning to retirement living. Regency Morristown understands the importance of having a qualified and trained staff, which is why we continually provide necessary resources to assist staff so they can give quality, excellent care for every resident. Assisted Living communities like Regency’s encourage residents to get involved in these activities, as science suggests these opportunities may be the key to a longer and healthier life. To learn more about Regency Senior Living, call 423-581-7075.